I tried reading a couple of C. J. Cherryh’s books (Foreigner and something else I can’t recall now) about 10 years ago. Could not get through them. My bookgroup, through a semi-democratic process, decided on Downbelow Station for next month*. Well aware of my past record with Cherryh, I eyed the 500-page volume with some trepidation. Apparently, I needn’t have worried. I got through it (I know, a ringing endorsement). Maybe it was me, maybe it was the book itself. The reason I’m not saying I liked it or that it changed my mind about Cherryh is because I still find her writing somewhat dry. The beginning of Downbelow Station is a mountain of exposition. If you manage to climb it, you’re (mostly) in the clear. Very often the narrative followed the clipped ‘and then some things happened’ route. Cherryh’s style seemed too terse overall, and I had difficulty picturing what was happening in my mind. I did not like Pell’s aliens. I’m somewhat willing to forgive the ‘primitive but friendly’ native population thing due to 1981 pub year, but still. It’s not 1881 pub year. It did help that I was obviously in the mood for some thick sci-fi when I picked this one up. Sometimes you need a book with lots of spaceships, trade routes, and the resulting complicated politics. In that regard, Downbelow Station succeeded. It is a book set against a backdrop of two entities, the Company and the Union, engaged in an interstellar war. Ships arrive, asking for permission to dock at Pell’s orbiting station. And arrive. Some with civil unrest on board, bringing more and more problems to an already overwhelmed station. There are many parts to the plot, and some of them seemed confusing or unnecessary (who are those guys who took the spaceship to talk to the Union people? I still don’t know). It’s one of those books where you feel the urge to visit Wikipedia to just figure out all these story arcs. Basically, Downbelow Station is rather like a 19th-century novel. It is sprawling. It is not particularly fast-paced. It is mostly about people and people’s interactions. And yet, the book often felt to me like a giant game of chess, distant and mostly about the mechanics of play rather than the pieces themselves. It didn’t help that most of the people in it were fairly unpleasant. It was a bit of a slog until page 250 (hey, I still have trouble abandoning books). Somewhere right in the middle of the novel, however, the book changed. The pieces were in place, the character creation part was done, now we could actually play. And at that point I found myself unable to put the book down. The last 200 pages I read almost in one sitting. Plus, the ending went quite far in redeeming the book in my eyes. 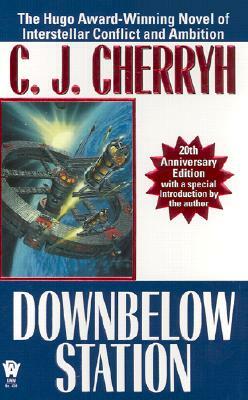 While I was not entirely enamored with Downbelow Station, I might read some more books set in the same universe. I might go on to Cyteen and Regenesis. Or maybe the Faded Sun novels that my coworker has been trying to get me to read for years. ** No, I am not going to explain ‘semi-democratic’. Yesterday I had a few hours in NYC, and I chose to use them wisely, to wit, by taking the F train down to Brooklyn and buying some old sci-fi from Singularity and Co. January is Vintage Sci-fi month, after all. It is probably just as well I no longer live in New York. I used to work one subway stop away from their store, and I have a feeling every day would have been an opportunity to ‘stop by and browse’, meaning ‘spend a lot of money on books instead of groceries and rent’. A few notes: my purchases were heavily influenced by my recent reread of Jo Walton’s Among Others (here’s my post about it and her work in general). It remains one of my favorite SF books, and, being meta-fictional, it comes with an added bonus of book lists (real books, mind you). In fact, there is a list of all books mentioned in Among Others on Walton’s blog. 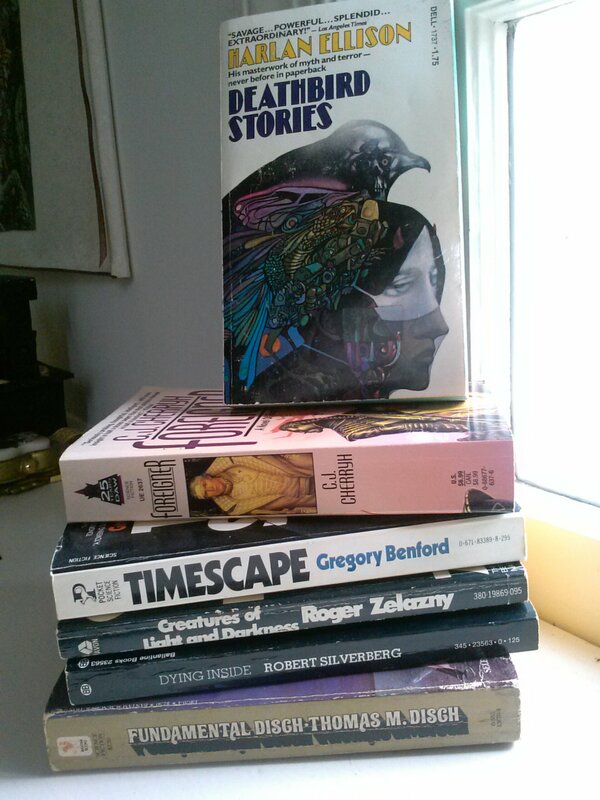 Silverberg and Zelazny were bought expressly with that book list in mind. Foreigner is also a Jo Walton-related purchase. 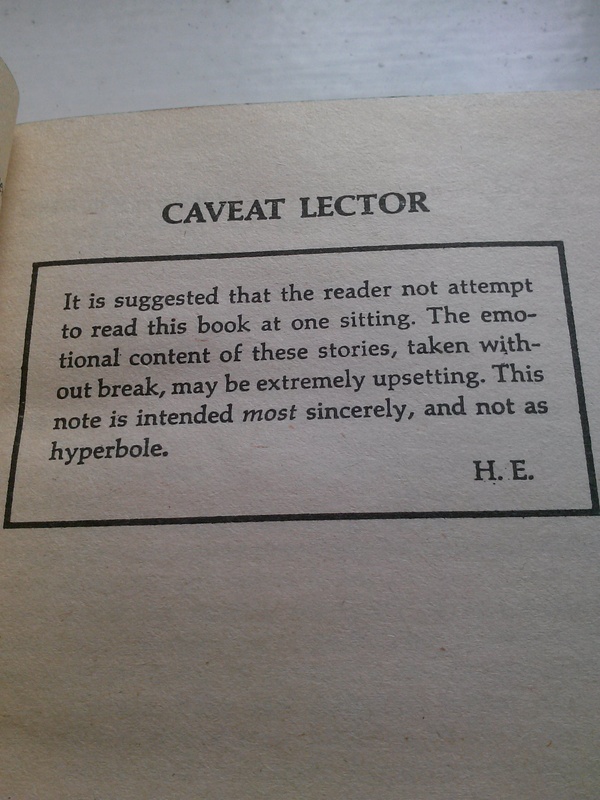 I confess I read it about 10 years ago, and I did not like it. Looking back, however, I realize it was just the wrong book at the wrong time — I was in Japan, going on some silly school trip with a bus of teens to Kochi city, and I was quite starved for books in English (e-readers not being ubiquitous then). I grabbed the first book I saw on my boyfriend’s shelf and took it with me. I didn’t even have that much time to read in Kochi, and so my experience of Foreigner was very fragmented and haphazard. A few years later I read Walton’s review of it on tor.com. The review is by no means glowing, and it does confirm my own feelings about Foreigner, but it did make me want to read the series, which means giving the first book a second chance. 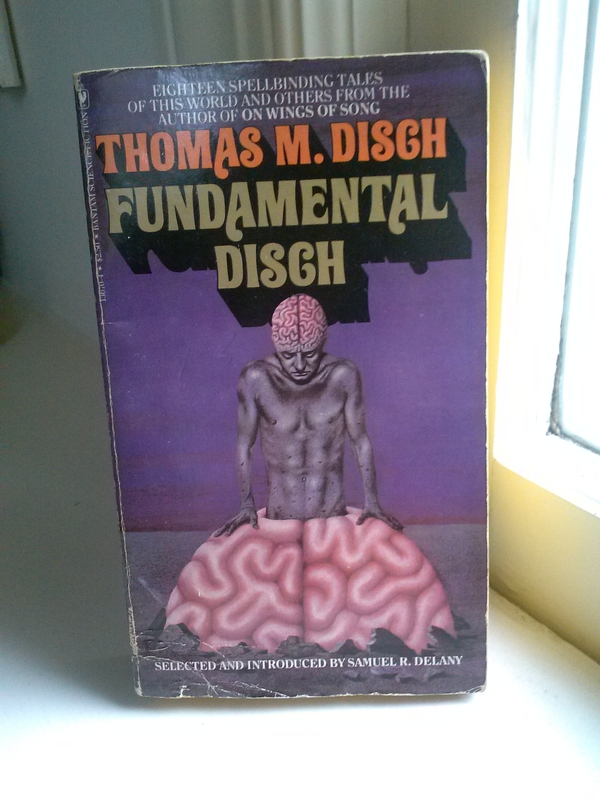 Disch has been on my to-read list for a while, and I grabbed the comfortably-titled Fundamental Disch. Besides, look at the cover, how could I not? 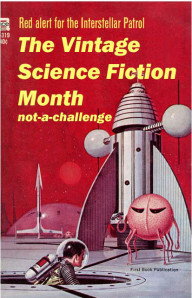 While not a review, this is a post for Vintage Science Fiction Month. Follow the link to the Little Red Reviewer’s blog for more vintage goodness.